The beautiful state of Punjab is the bread basket of India golden wheat is everywhere in the rich, well-irrigated countryside, with five rivers running through it. 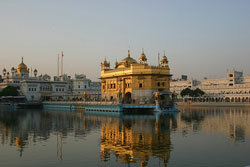 It is dominated by Sikhs and has many world-famous examples of Sikh architecture, the most famous being the Golden Temple of Amritsar. The countryside is home to renowned royal palaces, the small towns are showcases of traditional Punjabi style. Greater Punjab, considered as a cultural region, can be considered to stretch into some parts of Afghanistan, Pakistan, Indian Punjab, Haryana, Himachal Pradesh and Delhi. Punjab was the seat of the Indus Valley Civilization, the grandfather of Indian civilization. It is hot here from mid-April to June, rainy from July to September, and cold from December to February. Punjab is a rich district, and Punjabis give the impression of straightforward efficiency, but also sometimes of a lack of subtlety. Punjab has India's best infrastructure, its most extensive road, rail, air and river transport links, its the lowest poverty rate. From the late 1970s to the 1990s the Punjab suffered political and religious turmoil as militants battled to create a separate Sikh state, Khalistan. The Punjab insurgency caused several thousand deaths, but gradually ground to a halt in the mid-1990s. Chandigarh, Punjab's capital, is administered separately as a Union Territory, as it is also the capital of neighbouring Haryana. Planned by Le Corbusier, Chandigarh's architecture has been controversial ever since it was built. Designed with brutalist modernism, on an enormous scale which takes no account of the characteristic density of Indian street life, Chandigarh has vast empty spaces, flat stretches of grey concrete, and endless visual monotony. The distances are breathtaking. The plans were based on the idea of the "Radiant City" Corbusier's dreamed-of un-congested city centre, filled with sun, space, and greenery. Unfortunately the Radiant City's original drawings (in retrospect) look like a slum project extended as far as the eye can see, featureless high rises in straight lines. The city is starkly divided into inward-looking sectors of 800 by 1200 metres, each supposedly a self-sufficient neighborhood. A hierarchy of roads separates pedestrian and vehicular traffic into seven different road types. Its critics say the architecture is dull, and the modern concrete forms depressing.� The result was unhappily at odds with Indian conditions, where 70% of the economy was still agricultural. No provision was made for society's informal sectors, and significantly, the construction workers who built the city were underpaid, unhoused, and uncared for. Today nearly a third of the city's 700,000 inhabitants now live or work in slums, reflecting the fact that no provision was made for people of average incomes.� The ideal citizen seems to be a VIP driving through empty streets, arriving in a luxury assembly building, in a chauffeur-driven limousine. There are two satellite cities of Chandigarh: Panchkula and Mohali. Together these three cities are sometimes called Chandigarh Tricity.